The following diagram shows the formula for kinetic energy. Scroll down the page for more examples and solutions on how to use the formula. 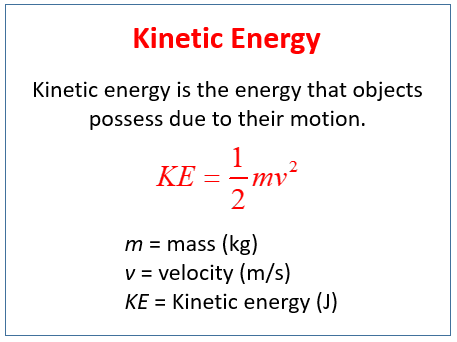 • Describe what is meant by kinetic energy. • Calculate kinetic energy for a moving object. Kinetic energy is the energy stored in moving objects. Stationary objects have no kinetic energy. 1. A car with a mass of 700 kg is moving with a speed of 20m/s. Calculate the kinetic energy of the car. 2. A cyclist and bike have a total mass of 100 kg and a speed of 15 m/s. Calculate the kinetic energy. 3. A tennis ball is traveling at 50 m/s and has a kinetic energy of 75 J. Calculate the mass of the tennis ball. 1. A 30 gram bullet travels at 300 m/s. How much kinetic energy does it have? 2. A 70kg man runs at a pace of 4 m/s and a 50g meteor travels at 2 km/s. Which has the most kinetic energy?. 3. A 5000kg truck has 400000J of kinetic energy. How fast is it moving? 4. A car traveling at 10 m/s has 200000J of kinetic energy. What is the mass of the car?